When I was younger, we would gather around the TV every holiday season for the classics. In the past it was always a boy and his dog. This year I'm adding a big cat and his dog to our rotation! 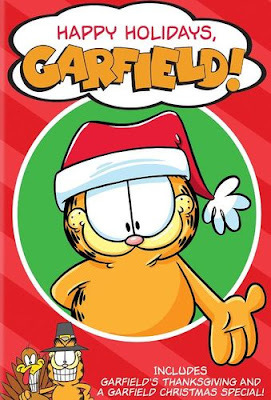 Garfield and Odie's Happy Holidays collection is a perfect fit for our watching. Jon Arbuckle invites veterinarian Liz to celebrate Thanksgiving with him, Garfield, and Odie! But Jon has no clue how to prepare a Thanksgiving meal and even worse—Liz declares that Garfield must be put on a diet… on the day before Thanksgiving! Will anyone come to the rescue and cook a delicious dinner for Jon and Liz? Garfield gives Grandma love notes he found that were written by her husband, from when they first met. That thoughtful gift shows Garfield that Christmas isn’t about eating lasagna or receiving presents—it’s about spending time with your family and making others happy! Happy Holidays, Garfield is available everywhere on DVD! Grab a copy and share some cocoa!